Durham Arts Council has proudly produced Art Walk since 2004. For 2018, expanded Art Walk Holiday Market festival features include indoor and outdoor exhibitors, performers on the Erie Insurance Music Stage, art activities for the kids, inflatables, train rides, and delicious local food truck fare, beer and hot cider. Visitors will clamor for beautiful hand-crafted creations (including the free Vega Metals ornament! ), just in time for holiday shopping. 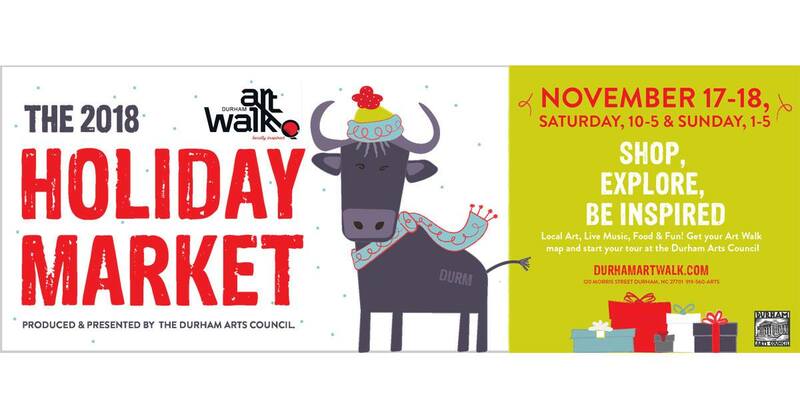 The Durham Art Walk Holiday Market is the perfect transition from the harvest to the holidays!